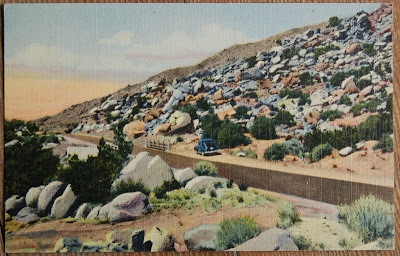 A - 38 SCENE IN TIJERAS CANYON, HIGHWAY 66, EAST OF ALBUQUERQUE, N.M. This "City of Rocks" is traversed on Highway 66 in Tijeras Canyon of the Sandia Mountains about near the west entrance of the Canyon. Want a boring postcard from Michael5000? Request up to one weekly in the comments! Here's me waiting and hoping that I can stay in the top three for the quizzes in order to get postcards, and it turns out I can just commment? Awesome. Owl: Send your address to the obvious Gmail account! Wait. If they are so boring, why are you giving them away? I volunteer to send a quilted postcard in exchange...for THREE New Mexico BORING postcards. Hope this ups the ante. Are you saying you would send me a boring postcard? Too cool! Elaine: WOAH WOAH WOAH! To clarify: I'll send a boring postcard, not a specific boring postcard. All of the cards seen on the blog are from the permanent collection. Jenners: Comin' at ya. You still live at 6221 Maple Blvd, Caxton, NC, don't you? Still leave the back door unlocked? Elaine: I'm just a poor boy with no quilting skills. Although tempted to start a bidding war I find myself without any chips. Okay, Owlet, I won't try to parlay my quiltitudinous mastery into out-doing things. Turns out that the Albuquerque post card is NFS, anyhow. Shucks. An aside: I thought you were a GIRL owl. Feathers disguise a lot of features, eh? That's exactly what I ment. The Great Movies: "Schindler's List"
The Great Movies: "Vivre sa vie"
The Great Movies: "It's a Wonderful Life"
Element of the Month: Tungsten!